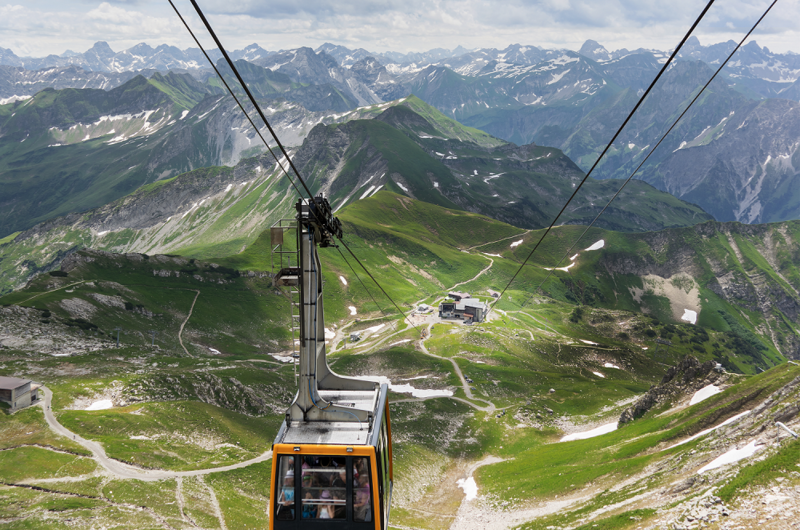 ﻿2016 was a year of challenges for the Nebelhornbahn in Oberstdorf as well as for our German Bridon-Bekaert entity in Gelsenkirchen; part of the newly formed Bridon-Bekaert Ropes Group, which returns into the rope cableway market. As part of this big project, which a.o. also consisted of the renovation of the peak restaurant, was the necessary replacement of all four-track ropes for the cableway. The Nebelhornbahn, located in Oberstdorf (Allgäu), connects the valley station (812m), the middle station and the mountain peak station with the 2224m high Nebelhorn. The Nebelhornbahn AG was founded in 1927 and went operational in 1930. During a first meeting early 2016 the responsible of the Nebelhornbahn were convinced of the solution oﬀering and competence of Bridon-Bekaert (at that time still BRIDON International GmbH) to deliver the ropes. Four track ropes were supplied in a full locked coil version with individual length of 2x2850 m and 2x2500 m and a rope diameter of 55 mm (round wire core with two layers of shaped wires). The construction of the ropes was specifically designed to meet the challenges of the cableway; our over a 100 years’ experience in this market allowed us to deliver a tailor made solution. The production of the ropes in Gelsenkirchen was intensively prepared, supported and well documented by our rope specialists. Intensive quality control and factory testing and the fulfilment of all requirements were demonstrated by intensive factory testing. The testing institute of IFT-Stuttgart (Institut für Fördertechnik und Logistik) certified the high quality during the manufacturing and in final testing. The renowned company Inauen-Schätti was appointed to install the 4 ropes. In close collaboration with our specialists, the installation was carried out in the autumn of 2016. After completion of the final inspection by IFT, the Nebelhornbahn was ready for operation at the beginning of the season. The close contact and intensive collaboration with our customer during the project was essential to succeed and meet their expectations. With this project, Bridon-Bekaert Ropes Group has successfully returned to the ropeway market.